July 17th, 2008: Sunny and Warm, Water Temp 85* and Clear. Picked clients up at their dock this morning and looked for breaking fish. Saw some punks breaking but no nicer fish so I hunted for some schools deep. I found a nice school, put out 6 rods full of lures and the fun began. We hit a couple of different schools and caught 20 Stripers before 9 am this morning. 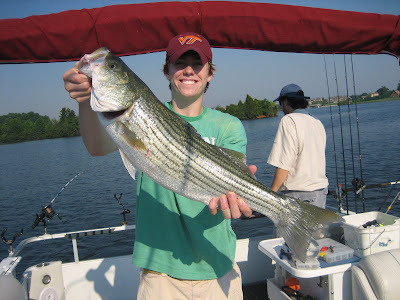 Mark is pictured hold his first Striper of the morning along with Ryan holding up a nice fish. 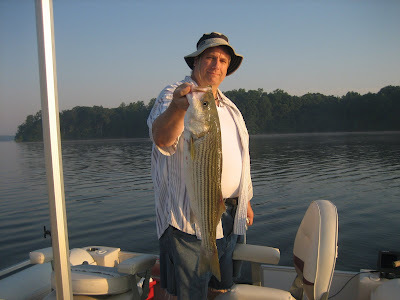 I did not get a picture of David with his big one of the day, he decided to release it before it ever got in the boat. It was my Good Deed of the day to let Mark and Ryan pull up the big 'uns. They really needed a bit of healthy father/son competition. 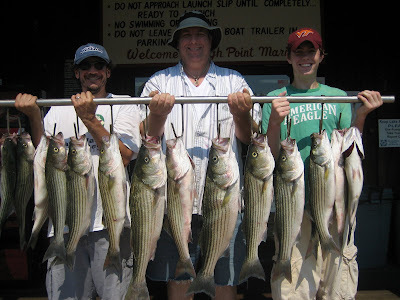 I was having too much fun pulling up the lion's share of the Fish of Mediocrity - a half-dozen keepers and a few throwbacks kept me plenty busy. Awesome day overall. This is the earliest time we've ever been off the water - 10:30!